OSSSC Junior Clerk Syllabus and Odisha SSSC Junior Clerk Exam Pattern are now available here. So, the candidates who have applied for OSSSC Junior Clerk Recruitment 2019 can download OSSSC Junior Clerk Syllabus & Odisha SSSC Junior Clerk Exam Pattern from this page. Here, the applicants can also get OSSSC Junior Clerk Previous Year Question Papers in PDF. Also, check OSSSC Junior Clerk Recruitment Notification 2019 details in the below table. Odisha Sub-Ordinate Staff Selection Commission has released 765 Vacancies for the position of Junior Clerk. So, the interested candidates can apply for this Examination via Official Website. Therefore, the detailed OSSSC Junior Clerk Notification 2019 has been provided in the above table. As the exam date for OSSSC Junior Clerk Recruitment 2019 is not yet declared, in the meanwhile, the candidates can start their preparation for the OSSSC Junior Clerk Written Exam 2019. Odisha Sub-Ordinate Staff Selection Commission has recently released notification for filling up 765 Junior Clerk Vacancies on contractual basis in various district/circle/range establishments under different Departments of Government of Odisha. Therefore, this OSSSC Junior Clerk Recruitment 2019 is an amazing opportunity for all the job hunters who are intently waiting for the latest Govt Jobs in Odisha. Most of the candidates have been registered for this OSSSC Junior Clerk Recruitment 2019. The OSSSC Junior Clerk Written Exam is divided into two levels – Written Test and Practical Skill Test. Therefore, the individuals need to qualify in all these two tests in order to get selected as Junior Clerk. Therefore, we suggest all the contenders of Odisha SSSC Junior Clerk Exam 2019, to start their preparation as soon as possible. As many of the candidates will be confused about how to start their preparation, we have provided OSSSC Junior Clerk Syllabus & Odisha SSSC Junior Clerk Exam Pattern here to help all those candidates. The applicants must plan a proper preparation strategy with the help of OSSSC Junior Clerk Syllabus and should prepare according to that preparation schedule. By doing this, they can perform well in the OSSSC Junior Clerk Exam 2019. Also, solve some OSSSC Junior Clerk Previous Question Papers in order to gain more time management skills and solving skills. Therefore, download OSSSC Junior Clerk Old Papers from the link provided below. 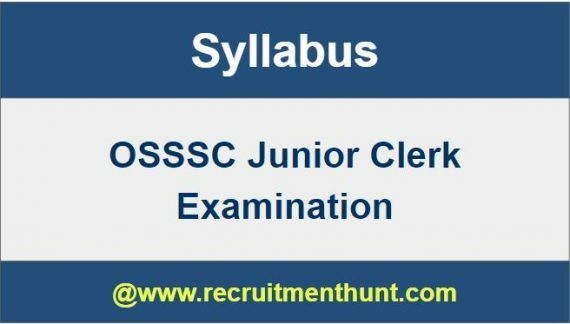 If you are looking for OSSSC Junior Clerk Syllabus PDF, then go through this article. Here, we have provided complete details of OSSSC Junior Clerk Syllabus and OSSSC Junior Clerk Exam Pattern. Therefore, you can download OSSSC Junior Clerk Syllabus for free & Odisha SSSC Junior Clerk Exam Pattern from the below sections. Without knowing the Odisha SSSC Junior Clerk Syllabus & OSSSC Junior Clerk Exam Pattern, the participant’s preparation is incomplete. Since they don’t know the exact topics or concepts that will be asked in the Odisha SSSC Junior Clerk Exam 2019 and if they are unaware of the OSSSC Junior Clerk Syllabus. Therefore, it is mandatory for each and every candidate to know OSSSC Junior Clerk Syllabus & Odisha SSSC Junior Clerk Exam Pattern before starting the exam preparation. The OSSSC Junior Clerk Written Test consists of two papers – Paper 1 & Paper 2. Each Paper consists of two parts. Paper-I is for 185 Marks and the time duration for this paper is 2.5 Hours. The Paper-II is organized for 200 marks and the exam duration is 3 Hours. The overall OSSSC Written Test is comprised of 385 marks for 5.5 Hours. In OSSSC Junior Clerk Skill Test, there will be questions from computer knowledge for 50 Marks and there will be Essay and letter writing in Odia for 15 Marks. The Exam Duration for Essay Writing is 30 Minutes and for Basic Computer Skills is 1 Hour. The complete subject wise OSSSC Junior Clerk Syllabus has been provided below. Therefore, the candidates can analyze all those topics present in the Odisha SSSC Junior Clerk Syllabus given below and prepare well for the OSSSC Junior Clerk Exam 2019. States, Countries, and Institutions with headquarters. Matching Historical Events with dates, personalities and places, Geographical facts with places. Current events with places and personalities. Scientific facts and discoveries with dates, persons, and uses. Matching questions of miscellaneous type. Essay writing on familiar topics (within 250 words). Letter Writing (Personal letter, Applications, Business or Official) (within 150 words). A paragraph writing on editing and formatting text and paragraph. A paragraph writing on Page and paragraph Setup. Making 2/3 slides using editing and formatting slides. Solving a problem by By formatting cells and data. Finally, candidates can download Odisha SSSC Junior Clerk Syllabus & Exam Pattern here. Applicants can make their preparation easier by following OSSSC Junior Clerk Syllabus. Download OSSSC Junior Clerk Exam Pattern along with OSSSC Junior Clerk Previous Year Question Papers through this article. Also, for more job updates subscribe and stay tuned to our website RecruitmentHunt. is there any negative marking for OSSSC jr clerk exam 2017?